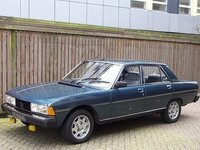 Have you driven a 1979 Peugeot 604? All Looks And No — I have to give this car its due. When I had it in college, I was ALWAYS under the hood--- so it actually introduced me to the wonderful sense of accomplishment you feel when you fix your own car. However, I could count on it to break down at the most inopportune times. Not very reliable. Looking for a Used 604 in your area?